Turn cracking open cold ones into a game that prompts party antics. Cracking open your favorite beer is always exciting. But what if we told you you could double your fun? 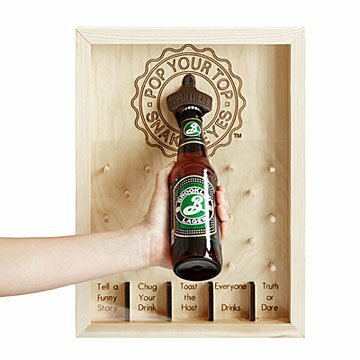 This game-show inspired opener turns liberated bottle caps into pawns that plink down to prompt party antics—from “toast your host” to “truth or dare.” The interactive game makes a great gift for any home bar or party pad. Handmade by Jeremy Exley in Minneapolis, Minnesota. I love this gift!! I did feel that it was a little small for the price but still happy with the purchase. Uncommon goods has a really cool selection to choose from. Adds a fun twist to opening your beer. Such a great housewarming gift! This product is awesome. Thought I wish it were a bit prettier to look at - i.e. stained/painted wood. It's still a great fun gift/game to give to someone.